The Technology Investigation team is working on exciting new technologies and we are looking for a dedicated Embedded Systems Software engineer. As a member of our fast-paced group, you will have a unique and rewarding opportunity to be part of a new project and shape upcoming products that will delight and inspire millions of Apple’s customers every day. Experience developing real time software for multi-sensor systems. Expertise in low level image, vision and signal processing pipelines. Expertise developing drivers and firmware to accelerate performance of real time media applications. Knowledge of low level hardware and OS internals at a kernel level. Experience with Rapid Prototyping, POC development and debugging. Curious and loves working with the best creative people in the industry to solve hard technical problems. Passionate, Inspired by Apple's mission and products. You will work closely with software, hardware, algorithms and UX teams to create ground breaking technologies and systems. You will architect and develop high quality software for real time interactive media applications. 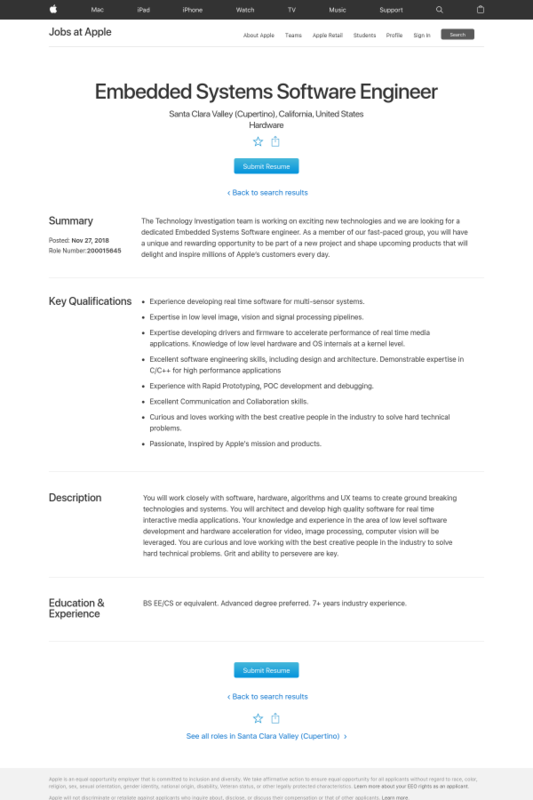 Your knowledge and experience in the area of low level software development and hardware acceleration for video, image processing, computer vision will be leveraged. You are curious and love working with the best creative people in the industry to solve hard technical problems. Grit and ability to persevere are key.